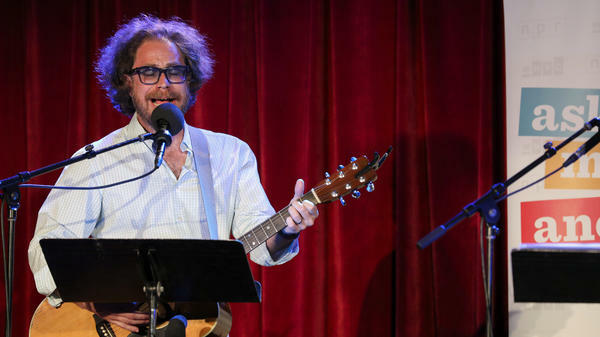 One-man house band Jonathan Coulton leads a music parody game on Ask Me Another at the Bell House in Brooklyn, New York. Thank you, Jonathan. Before the break, we met our contestants, Zoey and Ed. Next we have a game about bands with names so short, getting them tattooed on your neck won't even hurt, yeah, unlike my Ladysmith Black Mambazo tattoo. Let's check in with our contestants. Zoey, so you're also a teacher's assistant at a kindergarten. ZOEY TUREK: This past year I was, yes. EISENBERG: OK, so what kind of problem solving are you doing with children of that age? TUREK: Oh, boy, well, they're in a stage where they're learning a lot. And one of the things that we had to teach them is, don't go poop in the sink. TUREK: I had a student come into the classroom, and he said, I went poop in the sink. Not knowing what to do, I just said, OK, show me. So we walked to the bathroom, and, yeah, there it was. And the rest of the day, I spent puzzling, how did he get up there to do that? EISENBERG: How did he get up there? TUREK: How did he - it's a tall sink. EISENBERG: Right, right, OK, very good. Ed, you were part of a fraternity in college, and you were in charge of feeding everyone. EISENBERG: How many people were you feeding? BECK: On a slow day where there's only us in the house, it's, like, 25. On the roughest day, it was, like, 150 people. EISENBERG: So what are you making? BECK: The biggest meal I ever made was a hundred pounds of General Tso's chicken, which was, like - it was, like, a point of pride because we made our own sauce and own lo mein, and all that and - yeah. EISENBERG: Confections - any desserts? BECK: Bourbon pound cake is the No. 1 dessert. EISENBERG: Yeah, sounds about right. BECK: So that's been requested a lot. EISENBERG: How many bottles of bourbon go into a pound cake for 150 people? EISENBERG: Yeah, just to keep cooking. So this is a music parody game called Literal One-Named Bands. Ed, you won the last game. So you win this, and you are in the final round. Zoey, you need to win this, or at the next concert you go to, you have to stand beside the girl who sings with her eyes closed. That's you. TUREK: That's me. That's often me. EISENBERG: ...Which is kind of odd and wonderful. COULTON: In this game, every answer is a band whose name is just one word. Ring in, and name the band that most famously performed the song that I'm singing. We have changed the lyrics of each song to be about the literal definition of each band's name. For example, if I sang "Smells Like Teen Spirit" with lyrics changed to be about a transcendent state in Buddhism, you would answer Nirvana. Get it? COULTON: Here we go. (Singing) My baby just up and dumped me because I've been rejected by this whole damn town. I'm an outsider. I am a pariah. I will never live this down. COULTON: OutKast is correct. That's "Hey Ya!" COULTON: (Singing) So many mistakes - here, just remove these. Use the tip of your pencil, please. COULTON: You guys are both making faces like you ate something bad. TUREK: You talked about pencils, so I'm just going to go ahead and say lead. COULTON: That's a good guess. That's a good guess. EISENBERG: Ed, can you steal? COULTON: It is Erasure. That's correct. COULTON: (Singing) Tonight we will play. We'll feel joyful and delighted. We're so excited. We say yay. EISENBERG: Oh, Zoey wanted to ring in for that. COULTON: Zoey was very excited, but it's Ed's buzzer. Ed, do you know the answer? EISENBERG: Zoey, you love that song. TUREK: I've seen them live also, so I felt like I had to get that one, or else they're gonna hate me. And I'm just - I'm sorry, Fun. TUREK: A girl can dream. BECK: You can hate me for stealing that one. EISENBERG: Do you like car commercials? EISENBERG: That's the new Fun. EISENBERG: I don't know their old stuff. TUREK: You've got to listen to the old Fun. EISENBERG: The old - really? TUREK: The old Fun was better. EISENBERG: That is kind of the slogan of my entire life. COULTON: Yeah, tell me about it. COULTON: Here we go. (Singing) Sundays with you, we're working out the crossword - stuck on a clue, three letters for inspiration. Out of the blue, we both get it, and we say this out loud. COULTON: A-ha - that's right. COULTON: (Singing) Your antique lover's at the road show, got some jewelry to show you, and it might be worth some dough. It's a necklace, an oval and a portrait, too, that's been carved upon a background that's a different hue. EISENBERG: The song is "Word Up." The name of the band also refers to an actor making a guest appearance. COULTON: (Singing) They got a bicameral thing making laws in the U.K. House of Lords and House of Commons have their say. They're in the know. The queen is just for show. Oh, they're in the know. The queen is just for show. COULTON: Parliament - that's right. COULTON: (Singing) A pit, trench or abyss like the middle part of a wreath. A gap, orifice or a cavity in your teeth. This is a hollow place, a hollow place. There's nothing here. This is an empty space, an empty space. There's nothing here. COULTON: This is your last clue. (Singing) Need water - this desert's only getting hotter. But don't be distraught. There's a fertile spot. COULTON: Oasis - that's right. EISENBERG: All right, well done, both of you. Ed won that game, which means, Ed, you are going to our final round.